According to the National Security Strategy (NSS) of the Trump administration published in December 2017, today’s world is getting more competitive. The US and its allies are facing growing political, economic, and military competitions around the world. Two revisionist states, China and Russia, are challenging US prosperity and superiority as well as the liberal international order. The NSS also pointed out that strong relationships with allies are invaluable in order for the US to magnify its power and respond to the growing political, economic, and military competitions. As shown in the NSS, US allies in Asia and Europe are facing similar threats, namely, the emergences of two revisionist states. The other growing pressure on the US allies is that of “burden-sharing”, which the US currently believes is weighted in favor of the allies rather than the US. In Asia, Japan and other US allies have been facing Chinese expansion since the 2010s. China’s unilateral behavior has become more visible, especially so since it became the second largest economic power in 2010, surpassing Japan. China has begun to show its ambitions in the East China Sea, the South China Sea, and even the Pacific Ocean. Notably, since 2012, when the Japanese government nationalized the Senkaku Islands — a small group of islands in the East China Sea — Chinese vessels have frequently intruded into the waters surrounding these islands and have heightened tension by coercive use of paramilitary means. In Europe, NATO members are encountering Russian aggressiveness as it seeks to expand its territory and sphere of influence at the allies’ Eastern flank. The Russia-Georgian War of 2008 was a prelude to “hybrid warfare” featuring Russian intrusion to the self-proclaimed republics of South Ossetia and Abkhazia. This was followed by Russian military intervention in Ukraine with “little green men” and its unilateral annexation of Crimea in 2014. NATO was quick to enhance its defense and deterrence posture at its Eastern flank in order to respond to the new environment. Still, Russia raised tensions by showing its force in the Zapad 2017 military exercise and continuing intervention in Ukraine. In addition to the similarity of situations, it is likely that the US will demand its allies to share an ever greater portion of the defense burden in the future. In fact, at the NATO Brussels Summit in July 2018 President Donald Trump harshly criticized the European allies which had failed to meet the “2% pledge”. The US pressure for a greater contribution to allied defense is not a recent phenomenon. US presidents have been complaining about shortfalls in the defense spending of the US allies for decades. Under such circumstances, US allies need to consider ways to manage their alliance with the US whilst minimizing any increase of their military role and defense contributions in order that they can maintain public support while still providing an adequate contribution from the US perspective. For the allies to determine the contribution that they need to make, it is essential to make a comparative study and underline the full spectrum of “assets” and “liabilities”, or the “balance sheet” that indicates the value of the ally to the US. By examining the assets that Japan, Poland and other allies can bring to the alliance, we can see their overall strategic importance to the US. Conversely, it is necessary to examine areas in which each ally may be underperforming and could contribute more to the allied defenses. 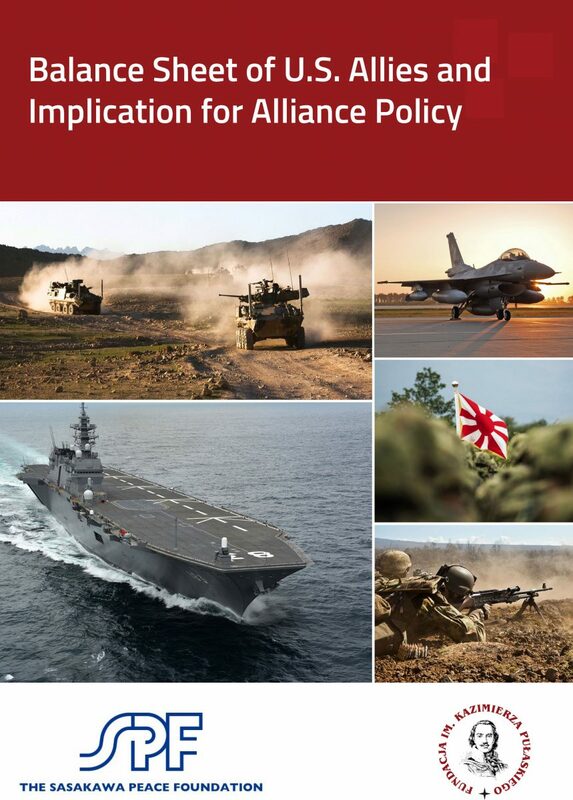 Through this process, a systematic appreciation, or balance sheet of each ally’s assets and liabilities can be drawn up from which US allies can assess its ability to meet the anticipated demands that will be placed upon it by Washington in the future.